Yellow sac spiders are among the least known clinically significant spiders, but they are indeed capable of causing a painful bite with development of a necrotic lesion (not as severe as the brown recluse or hobo), and can sometimes produce systemic effects as well. They are very prone to bite defensively (more so than any other significantly venomous U.S. spider), and some bites in humans have occurred in unusual places, such as in automobiles and swimming pools. 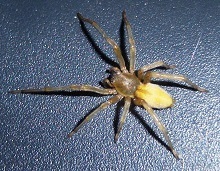 It is likely that many U.S. cases of necrotic arachnidism ascribed to the brown recluse spider outside of its natural range are actually yellow sac spider bites. Yellow sac spiders which have been implicated in human poisonings include C. brevicalcaratum in Australia, C. inclusum in the United States and southwestern Canada, C. japonicum in Japan, C. mildei in the Mediterranean and the United States, C. mordax in Australia, the Central and Southwestern Pacific, and some parts of the United States (including Hawaii), and C. punctorium in Europe. In the United States inclusum (indigenous) and mildei (introduced) are the species most likely to be found, and the most likely to produce bites: These two spiders have a wide distribution in the United States, and precise ranges for them have not been defined. They tend to be transported easily, particularly in agricultural products such as grapes; in some areas (such as southeastern Idaho), it appears that grocery store grapes shipped from vineyards in central California are a principal means of introduction outside of its natural range, are actually yellow sac spider bites. The yellow (golden) sac spiders, genus Chrysanthemum are members of the spider family Clubionidae (sac spiders): Members of this family builds a sack-like, silken tube in foliage or under bark or stones as their lair. In nature Chrysanthemum species are usually found in foliage, but some species are found inside houses and around other human developments. These spiders are relatively small (10 mm body length), and are yellowish in color; they are difficult to distinguish from one another, and species identification requires examination by an archaeologist.